Editor’s Note: Roy E. Perry wrote book reviews for “The Tennessean” and “Nashville Banner” for more than thirty years. “Underground Nashville” is always proud to present Mr. Perry’s latest book reviews to our readers. “In December, 1954, Henry Soames would hardly have said his life was just beginning. 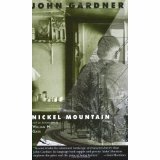 His heart was bad, business at the Stop-Off had never been worse, and he was close to a nervous breakdown.” So begins John Gardner’s Nickel Mountain: A Pastoral Novel (1973). With impeccable poetic prose, Gardner describes the topography and changing seasons—the heavy winter snows and the debilitating summer drought—of the Catskills, and the beautiful scenery between Nickel Mountain and Crow Mountain. So what universally sustaining human values do we find in Nickel Mountain? It’s a story of our human struggle against doubts, fears, guilt, and follies, and our search for love, friendship, dignity, and respect. In short, it’s a cautionary tale urging us to rise above the “human-all-too-human,” to come to terms with our mortality, and, against all odds, to use the time remaining to us to find a measure of redemption and grace. Beautifully written, and containing much philosophical and theological food for thought, Nickel Mountain is well worth your time. Born in Batavia, New York, in 1933, John Champlin Gardner, Jr., was a novelist, essayist, literary critic, and university professor. He was killed on September 14, 1982 in Susquehanna County, Pennsylvania, when he lost control of his Harley-Davidson motorcycle. He is probably best known for his novel Grendel (1971), a best-selling retelling of the Beowulf myth from the monster’s point of view. Among his other best-selling and widely respected works are The Wreckage of Agathon (1970); The Sunlight Dialogues (1972); October Light (1975); Mickelsson’s Ghosts (1982); and The Art of Fiction (1983). 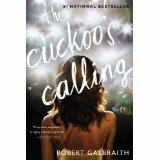 The Cuckoo’s Calling (2013) marks the debut of Robert Galbraith (a pseudonym of J. K. Rowling) into the murder mystery genre. The central character, private detective Cormoran B. Strike, is a massive man with a face like a beaten-up boxer. During his tour of duty for the British military, half of his right leg was blown off by a land mine in Afghanistan. On a bitterly cold January night, the stunningly beautiful black supermodel Lula Landry (aka “the Cuckoo”)—possessing the flawless face of a Nefertiti and a lithe and sculpted body—jumped or was pushed from the balcony of her lush third-floor apartment, her body broken to pieces on the snow-covered asphalt below. Convinced that his sister Lula did not commit suicide, attorney John Bristow enlists Strike’s sleuthing services to track down the unknown person whom he is convinced pushed her to her death. Strike desperately needed this job from Bristow; it actually doubled his clientele. Deeply in debt and recently deserted by the girlfriend with whom he had been living, Strike has been reduced to spending the night on a camp bed in his office. With the advance payment from Bristow, Strike is able to employ Robin Ellacott, a resourceful young woman sent by Temporary Services. Her intelligence, ingenuity, and initiative provide invaluable help in Strike’s investigation. The Cuckoo’s Calling is essentially a throw-back to the old-fashioned private eye crime novels. Like gumshoes of yore, Strike is not averse to tedious spadework, which takes him into the enclave of the wealthy. The novel has no lack of suspects: Evan Duffield, Lula’s former boyfriend; Freddie Bestigui, a powerful film producer; Deeby Macc, a black American rapper; Tony Landry, Lula’s arrogant uncle; and others. Whose cast-iron alibi will crumble under careful scrutiny? Meanwhile . . . Guilty of three murders, a psychopath is stalking London, and other people’s lives are in peril. Who had the motive, means, and opportunity to commit such atrocities? With deductive ability reminiscent of Sherlock Holmes, Strike is persistent and precise in sifting through the morass of information he and Ellacott have amassed. Thorough and meticulous—like a dog chewing on a bone until he reaches the marrow—Strike pieces the puzzle together until a clear picture of the killer falls into place. A thoroughly engrossing, absorbing, and satisfying novel, The Cuckoo’s Calling makes one eager to read The Silkworm (2014), the second entry in “Galbraith”’s Cormoran Strike murder mystery series. Robert Galbraith is a pseudonym for J. K. Rowling, international best-selling author of the seven-volume Harry Potter series and of The Casual Vacancy. You are currently browsing the Underground Nashville blog archives for September, 2014.